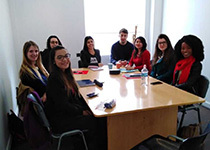 If you are going to come to study Spanish Courses in Chile, it is clear that Santiago de Chile (or just Santiago, as it is known more locally) is the obvious choice. As the beating heart of Chile, it is an epicentre for culture and the language school there can provide you with many great excursions and activities around the area. 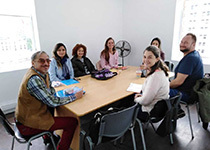 The following Spanish courses are available in Santiago de Chile. Click on the Spanish course you're interested in to see more details. You can take our highly popular intensive group course here, which is the standard choice for most students due to the ratio of lessons to free time and the attractive price. Alongside this – or any of our courses – you will be able to indulge in afternoon activities with the school or head off to explore the city on your own, while on weekends you will get the chance for one or even two day excursions around the surrounding area. During the super intensive group course you get the option of having ten extra lessons per week in a group. This will increase your studying time and make it easier for you to learn more within your stay, and if you like private lessons there is a course made of just those for you too. Want to learn Spanish in Latin America with a bit more of an up-tempo vibe? You can try our combined Spanish and salsa program, split between around four hours of Spanish a day followed by one or two hours of dancing. You will be able to get into the real spirit and style of this traditional dance, listening to classic salsa music as you learn the moves that you will be able to show off with finesse when you return home. Whether you want to impress the ladies or just make your girl friends jealous, this is a great skill that you can really use when you get back, alongside the fact that your Spanish practice will be so much more fun with dancing involved! If you are feeling generous with your time – or perhaps feel that your CV needs a boost – you could opt for our two month volunteer program. You will get four weeks of Spanish classes included at the start – enough to give you a real head start on the language and get talking at a good conversational level – followed by four weeks of volunteering work that will be very rewarding. The smiles of the people who thank you will be all the payment you need!